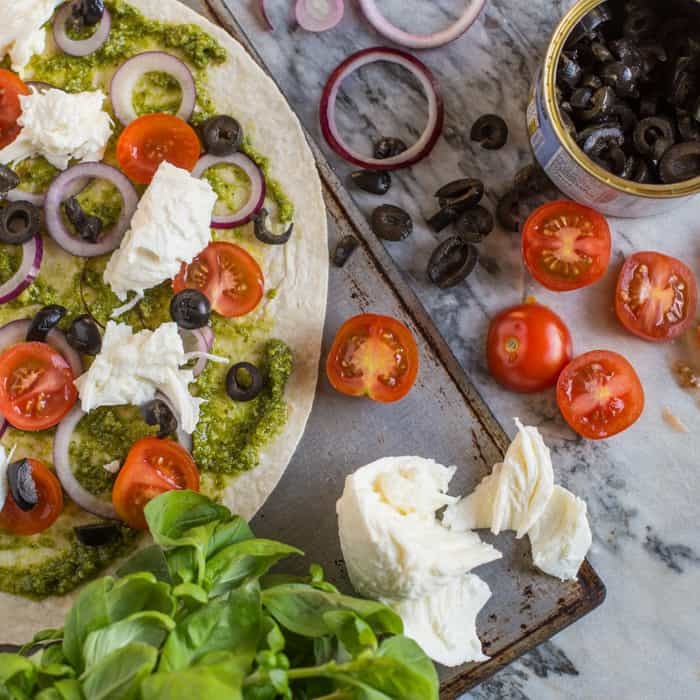 This Pesto Tortilla Pizza is a fresh, quick and vibrant dish and won’t leave you feeling weighed down with a heavy pizza dough. I’m pretty sure that this pesto tortilla pizza will become a family favourite in no time. It’s lighter in carbs than traditional pizza, as the base is a really thin tortilla wrap. It’s full of fresh, healthy and tasty flavours and takes zero effort on your part. In fact, it’s so easy, you can sit back and let the younger members of the family pile up those flavours for you! I topped my tortilla with Giovanni Rana’s basil pesto, which you can currently find in Asda. Let it settle in the fridge for a while, then spoon off the oil that rises to the top. Mind you don’t waste that oil – pop it back into the fridge as it makes the most amazing pesto scented roast potatoes! Next up I added a handful of halved cherry tomatoes and slices of red onion. I finished off with torn shreds of Buffalo mozzarella, black olives and fresh basil leaves. A classic combo of authentic Italian flavours that make a brilliant mid week meal of very little effort. To find out more about living, and eating, the authentic Italian way, you can visit the Live Italian website for fascinating articles and sumptuous recipes. And for more info on the pesto and full range of products, hop on over to the Giovanni Rana website. Spread the pesto evenly over the base and then top with the various toppings. Bake for around 8 minutes, or until the cheese has melted and the tortillas are crispy and golden brown. Huge thanks to Giovanni Rana for sponsoring this content and allowing me to continue to bring you tasty food, for free. As always all thoughts (and leftovers!) are my own. This looks so yummy! I especially love the addition of the pesto – it’s my favorite addition to so many recipes. Me too Ali, I can’t get enough of the stuff!! What a gorgeous twist on pizza! I love the sound of using tortilla and that stunning pesto. This is a BRILLIANT idea! I love pesto and this pizza would be a perfect lunch for me! Thanks! This looks like the perfect lunch idea! 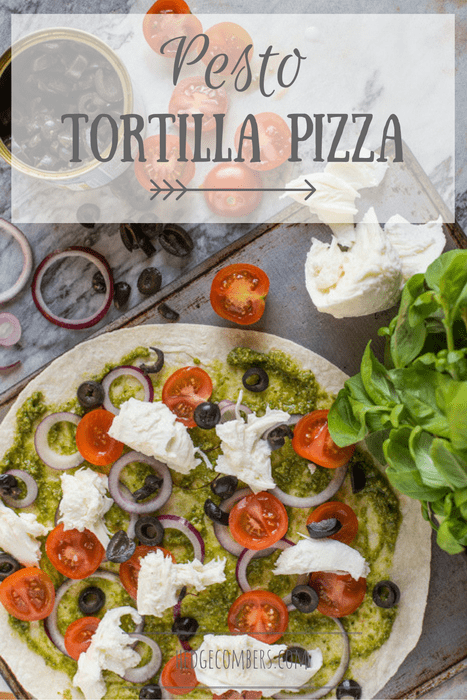 I love making tortilla pizzas but always get stuck on what flavour to make next – this pesto version looks delicious! This is excellent on pizza but great with toasted Italian bread, too! Great for the holidays! Oh yes! Actually, my favourite way to use pesto is in a crispy bacon butty – deeeeelish! Such a good way to use a wrap. All the goodness of a pizza without the heaviness of a big base. 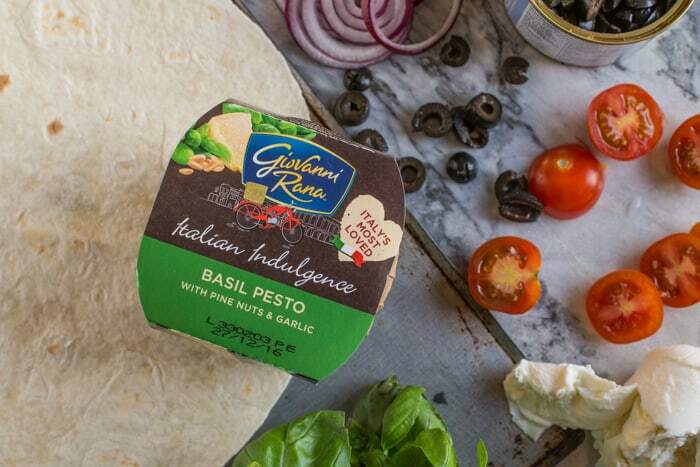 Love the Giovanna Rana products too, we always have some of their filled pasta in the fridge.